Many interesting Taj Mahal facts and myths have surfaced over the years, but the real history is much more fascinating than any fiction. India's most iconic mausoleum, inspired by love, has awed millions of visitors with its serene beauty. Over 7 million visitors a year come to see the magnificent structure. The Taj Mahal is India's most popular tourist attraction, however, many visitors leave without knowing the real story. Unsurprisingly, the popularity of the Taj Mahal means that the surrounding neighborhood has turned into a tourist trap. Be prepared to run the gauntlet but don't worry: the reward is worth the effort. Don't wait too long to go see the Taj Mahal for yourself. The reports of structural cracks and foundation problems — the Taj is constructed in a river basin — become more worrisome every year. Fact #1: Sick with grief, Shah Jahan was first inspired to build the Taj Mahal after his third wife, Mumtaz Mahal, died while giving birth to their 14th child. His wife was in labor for 30 hours before she died at age 40. Fact #2: The four minarets (towers) surrounding the Taj Mahal were constructed farther away from the main structure than usual. The minarets also lean slightly outward rather than stand straight. This was done as a safety measure so that if any of them fell, they would fall away from the tomb rather than crash into the central structure. Fact #3: During British rule in India, the garden was landscaped to look more like the manicured lawns in London, England. The original garden was adorned with lots of roses and daffodils. Fact #4: The Taj Mahal contains a working mosque and is closed on Fridays for prayer. Respect should be shown while visiting because it is an active religious structure. Dress appropriately, despite the heat. Fact #5: There is no proof to support the long-standing myth that artists and architects involved with the construction of the Taj Mahal were later put to death so that they could never "repeat such a beautiful feat." Instead, historians believe that they were required to sign contracts. Fact #6: With construction beginning around 1632 and finishing in 1653, the Taj Mahal took an estimated 22 years to build. Small refinements continued thereafter. Fact #7: Ustad Ahmad Lahauri, generally regarded as the chief architect of the Taj Mahal, was not Indian; he was a Persian from Iran. Fact #8: Islamic tradition forbids the decoration of graves, so Shah Jahan and his wife are actually buried in a plain crypt beneath the main inner chamber of the Taj Mahal. Fact #9: Shah Jahan's other wives and even his favorite servant are buried in mausoleums just outside of the Taj Mahal. 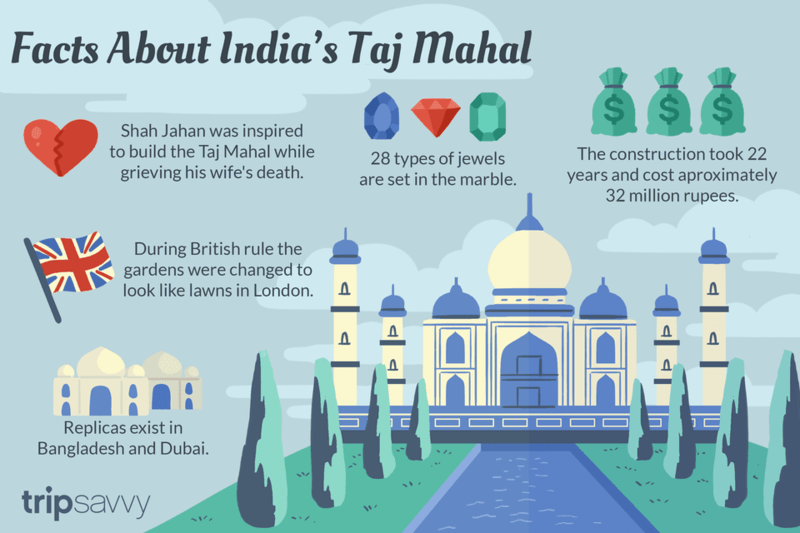 Fact #10: Construction of the Taj Mahal cost an estimated 32 million Indian rupees (the equivalent of over US $1 billion at the time). Fact #11: The structure on the western side of the Taj Mahal is thought to have been used as a guest house. Fact #12: Over 1,000 elephants were used to transport heavy materials and supplies for construction. Fact #13: A total of 28 types of precious and semiprecious jewels are set in the marble. The turquoise came from Tibet, and jade came from China. Heavy white marble — the principal building material — was transported from Rajasthan. Fact #14: British soldiers pried precious stones from the walls of the Taj Mahal during the Sepoy Rebellion in 1857. Fact #15: An estimated 20,000 laborers were recruited from all over Asia to contribute to the massive project. Remnants of their massive encampment, bazaar, and living quarters are now a nearby neighborhood. Fact #16: Following the Taj Mahal's completion, Shah Jahan was put under house arrest in 1658 by his son, Aurangzeb. Shah Jahan was only able to view the Taj Mahal from his window for the last eight years of his life before being entombed there. Fact #17: False structures and scaffolding were constructed around the Taj Mahal throughout different conflicts to confuse German, Japanese, and Pakistani bomber pilots. Fact #18: The Taj Mahal's white marble is rapidly turning yellow because of terrible air pollution in Agra. Only electric vehicles are allowed near the structure, and a 4,000-square-mile environmental radius was declared around the monument to help control emissions. Visitors must walk or take electric buses from the parking area to the Taj Mahal. Fact #19: The Taj Mahal is actually cracking at an alarming rate due to lack of groundwater beneath the structure. Wooden foundations — once submerged — are thought to be rotting. Even the minarets are beginning to lean more. Fact #20: The Taj Mahal was declared one of the New Seven Wonders of the World in 2007, receiving more than 100 million votes. Voting for the Taj Mahal actually helped push the controversial internet-and-phone-based poll into the world spotlight. Fact #21: In 2008, a Bangladeshi filmmaker constructed a replica of the Taj Mahal at a cost of US $56 million dollars so that his impoverished countrymen in Bangladesh could enjoy the famous monument without traveling to India. The replication took five years to complete with modern equipment. Fact #22: A Taj-inspired luxury hotel, event, and shopping complex is under construction in Dubai. The Taj Arabia, as the replica is called, will be four times the size of the original and will cost an estimated US $1 billion. The 20-story glass hotel will contain 350 luxury rooms. Visiting Tip: Excluding Fridays and the Ramadan holy month, the Taj Mahal is open two nights before, during, and after the full moon every month. On a clear night, the full moon provides a soft, eerie light for enjoying the Taj Mahal.